My first visit to Kerala was even more than what this small coastal state could offer. After all, I was going to meet Anne and Joe for the first time in my life! I have known Anne and Joe for over a year now. Rebecca aka Bec (Anne’s daughter) supported me with my tuition fees in the college and Anne & Joe along with Bec’s contribution helped me with my course fee post College. Anne & I have been in touch for quite some time now. We spoke on emails and social media every so often. But even then, we had known very less of each other. On the other hand, Joe had been a complete stranger to me despite knowing how he looked like. I was more than excited and curious to meet this lovely couple. I landed at the Trivandrum Airport at 9 am. I didn’t see Anne online on WhatsApp and I started wondering if she had forgotten to receive me as she had promised. I tried reaching her on her mobile number, but sadly I didn’t have international outgoing facility. Luckily I received a text message from her. She informed me that she had gone to the wrong terminal and told me that it might take some time for her to arrive. When I exited the airport, I saw Anne waiting for me at the arrivals. I recognised her immediately not only because she was the only English lady in the crowd, but there was this ebullience on her face that I had seen in her photographs. Tall and white, she sported her light-golden bob hair with all the grace. She wore a Grey dress, if I remember properly. But it was her eyes; it had some sort of an unmistakable spark. She was exactly as I had always imagined. To my surprise, she also recognised me instantly. She even told me later, ‘I am a foreigner so it wasn’t very difficult for you to recognise me, but I also recognised you right there!’. We hugged each other, she said ‘How lovely to finally meet you, Kritika’. We walked to the parking lot and we were accompanied by a friend, Kunjumon aka Kunju – a native of Kerala who helped me with my luggage. When we reached the parking area, Anne introduced me to Joe who looked fairer than her. An old man in green check-shirt, Joe wore spectacles. He pecked me on my cheeks and said ‘Nice meeting you, Kritika’. We started our journey from Trivandrum to our destination – the backwaters in Alleppey or as they now call it, Alappuzha. Kunju drove the White Swift Dzire and Joe sat on the front, while Anne and I sat on the back seat. We passed by different places as we started the trip and the places looked very similar to many of the under developed Indian cities, the only differences was the language on the hoardings. Malayalam is the native language of Kerala, but to me it looked as if somebody had scribbled neatly on a huge board. It looked rather scary to me. Ironically, I am a Malayali woman, born and brought up in the North – East. Even Anne was in shock when she got to know from Kunju that my last name ‘Nair’ is a Kerala surname. Apparently, it was my 1st ever visit to Kerala! 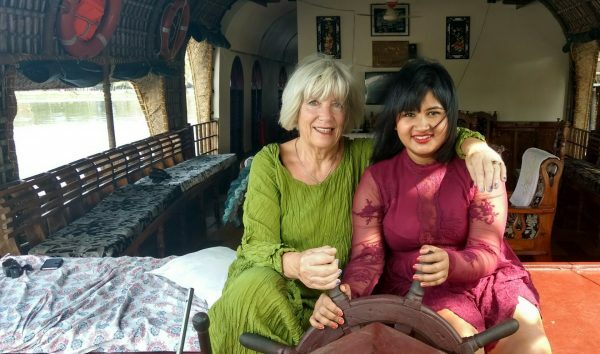 As we drove, Anne and I talked endlessly; Politics, News, England, Donald Trump, my native place Sikkim and every other topic that we could probably talk about in the 3 hours of road journey. We both had been saddened by the fact that how men in power can lead the whole country to a huge travesty. Surprisingly and very fortunately, Anne and I had a similar approach to things and similar outlook about the world. The demonetisation policy in India had driven the country crazy for quite some time now, but we were astonished when we saw longer queues outside the liquor shops than at the ATMs. Anne asked me if I were into drinking alcohol, I told her that sometimes I like to have White Rum. She said that’s the drink of young ladies in England as well. We halted at a place as Joe had to buy some beer. Anne took a picture of me holding a wine bottle with her mobile phone so that she could later show it to Bec. 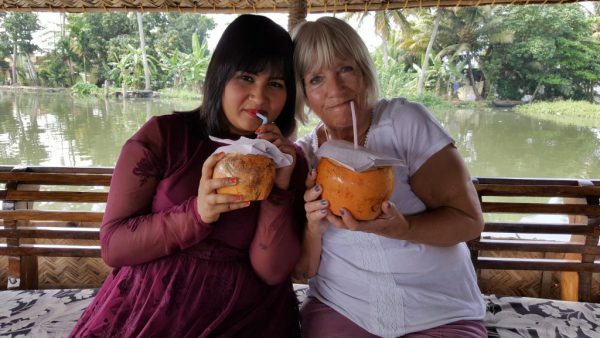 Bec had taunted Anne before to not to lead me ‘astray’.After a long journey we finally arrived in the backwaters. It was one such view I had only seen in the movies before. There were as many as 20 houseboats in that calm water whose banks either had coconut trees or small houses. Every other houseboat was built differently. Some houseboats also had rooftops. I told Anne about the rooftops to which she responded ‘Oh Kritika! 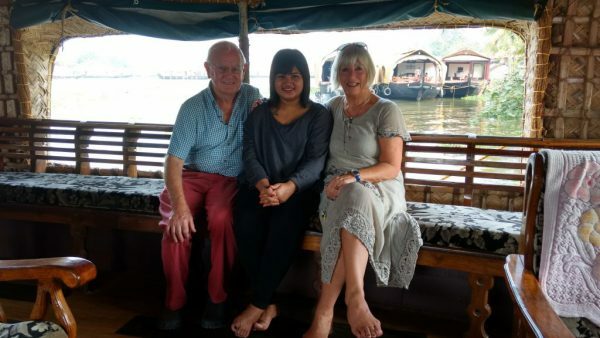 It’s not an ordinary boat.’ Kunju took us to the houseboat where we would sail for the coming two days. We all climbed into the boat one by one. The boat had all the needful amenities. There were sofas, a dining table, and a television (which we never watched) and there were two rooms. Inside each room there was a bed, a closet, a mirror and an attached washroom. We were welcomed by three people inside the boat – a cook, a driver and a helper. Anne and Joe surprised me with a gift. Anne handed me over a pretty – gift bag and told me to take out the gifts before them as they wanted to seize my reactions. I was obviously very happy when I saw a blue and grey coloured scarf, lavender body butter and a gift box which had lavender soaps. The soap box was not an ordinary soap box but a musical one with a key. I loved it. Anne told me how in England the love for lavender soaps has revived among the young women. I thanked both of them and brought the Christmas Cards which I had thought to give them later. I gifted Anne and Joe and told them not to open unless it’s Christmas. We started sailing on the boat and our cook served us with lunch. There was rice, papad, fried fish and two dishes of veggies cooked in coconut oil for lunch. But the best feeling was enjoying your meal while you know you are sailing. It was already dark when I got up from my long nap after the tiresome journey; first Bombay to Trivandrum and then Trivandrum to Alleppey. When I woke up, the houseboat was already towed and tied to a tree and we would sail only tomorrow morning. Anne offered me some wine. She told me that ‘tomorrow you will tell us about how you were brought up, your family and everything’. But after some liquor I just couldn’t stop talking. I sat on the deck of the boat facing Anne and Joe who sat on the couch. I was blabbering so much that I don’t remember anything what I talked about. But I remember that Joe was impressed as he had thought that I would be very shy. He also bizarrely said that I could later become the Prime Minister of India. I told Joe that I never would want to be one and then we all laughed. After I woke up this morning we went for a walk in a nearby village. Anne wanted to watch people washing and cleaning. She told me that she had always enjoyed watching Indians doing their household chores, because it was very different from how they do it in England. But we were in anguish seeing the miserable condition of garbage in that surrounding. After sometime we started sailing again. Today there were not as many boats as there were yesterday. Both Anne & Joe told me that they were very disappointed this time. They even said that they would never come here again. They had visited many a times before when it used to be very different – peaceful and with very less number of boats. Now there are as many as 1500 houseboats in Alleppey which has ruined the beauty of Alleppey. 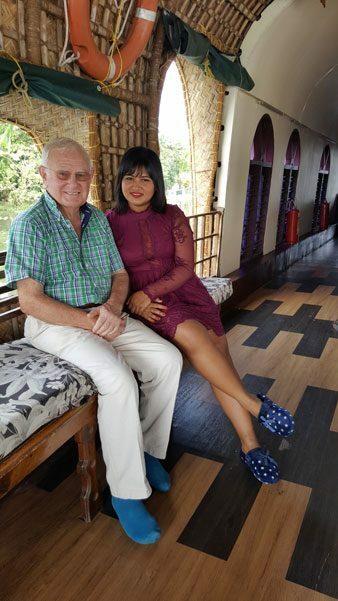 I told Anne ‘Shame that we just don’t know where to stop’ and we both referred to the story of the Goose that laid the golden egg as we talked about the so called booming industry of houseboats. Luckily today we could enjoy our drive in the backwaters. We sipped in some coconut water. We took photographs on the deck. 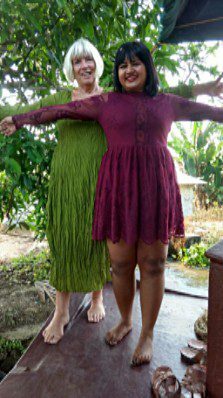 Anne and I also did a ‘titanic’ pose. I drove the boat once (helped by the driver, of course). We watched a snake fish post lunch. We waved at the other tourists in their boats as they passed by ours. We listened to music; Joe wasn’t really pleased with my taste in music. But we three shared love for Edith Piaf. Next morning I had to say goodbye to the boat and to the couple. Anne & Joe would visit Thekkady and I had a long journey to Kozhikode. I appeared all dressed – up again and Joe told Anne ‘Look! Kritika must be a very fashionable lady in Delhi’. I hugged Joe and said ‘I am sorry if I had been a bit too much’(Who for God’s sake would drink liquor in front of their sponsors!). He smiled and said ‘My dear, you were a surprise’ to which Anne responded ‘I knew about Kritika and I have always imagined her this way. Had she been shy, she would never have come to visit this far. It takes a lot of courage to come and spend time with strangers’. I thought to myself ‘you were never really strangers to me’. We took our last picture inside the boat. Kunju drove us to the Alleppey Railway Station. I hugged Anne and Joe for the last time before they left. Then I waited alone for my train. PS, I wonder how more lucky can I be. I could never imagine in my life that I would ever get a chance to meet the people who have helped me when I had no one than my elder sister. I remember Anne told me that she is very proud of me that I have come a long way in life’s battle. But I know that my journey of life has only begun. There’s still a long way to go. I can never really express how thankful I am to the entire HELP Family – Jim, Ben, Bec and also Seamus who have been there – seen me in my ups and my downs and helped me throughout. Indeed I am a lucky woman that despite having been through misfortunes at a tender age I have come a long way that I not only met my sponsors but they have now become my friends. They have become my family! It has been so nice reading this… Wat i found extraordinary is the simplicity tht comes out…i couldn’t stop myslf frm cmpleting it.. Way to go.. Best wishes..!!! !